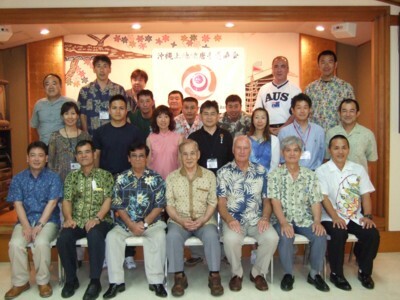 delegates stay at Okinawa till 30th,April to study karate and kobudo. 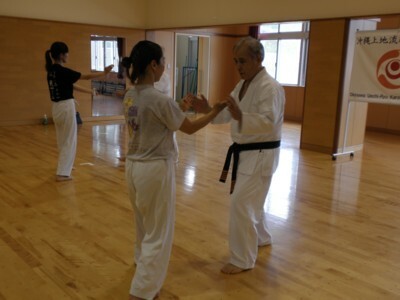 On Feb 22th,Mr.Marcos Tanaka who is a member of Argentina branch came to training center and took part in special class by sensei Shizaburo Okuhama. 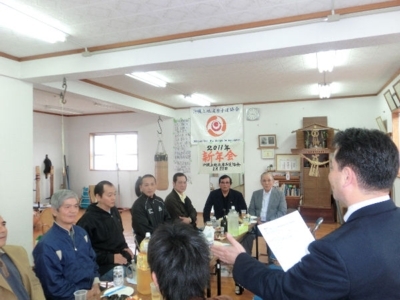 On Jan 23rd HQ held board meeting & new year party at Ishikawa traning center. 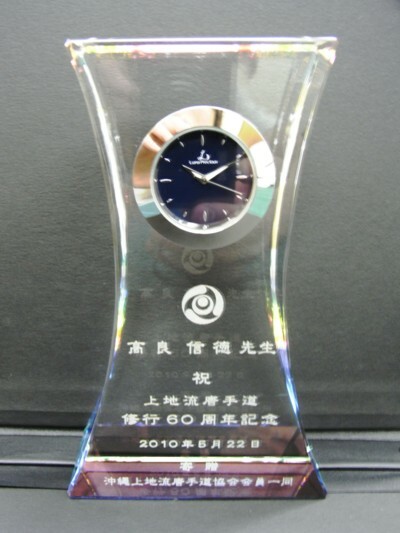 HQ will have special seminor & Dan testing on Jun 4th, general meeting on Jun 5th 2011. On Nov/21st HQ held board meeting & Dan promotional testing. 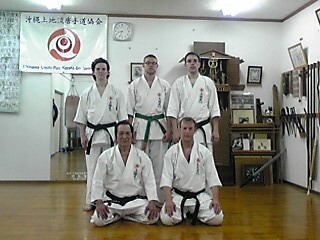 Mr.Shinzaburo Okuhama passed 9th Dan, Mr.William Repoff passed 8th Dan and Mr.Maxwell Repoff passed 2nd Dan. The board appointed Mr.Shinzaburou Okuhama director. Details of the board meeting will be informed to all Dojo ownners by e-mail. On 22nd, 23rd/May, Association head office had spring event with foreign branch leaders attend the event. At Okinawa city martial arts studium, Grand Master Takara sensei lead special seminor which foreign members and 12 instructors from Tokyo participated. 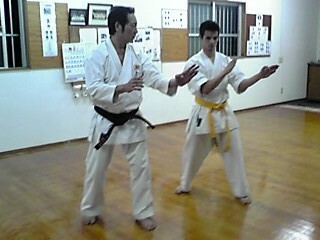 On the seminor, Hanshi masters instruct Sanchin and Kata.The instruction is refer to details of Uechi-Ryu Karate technichs. 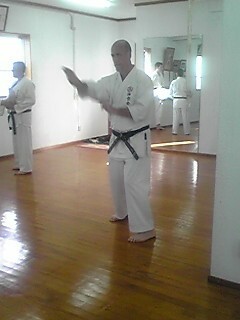 demonstrated kata which was filmed for future instruction to association members. Dan Test was followed after seminor members applied for test. After the test, we had party at Okinawa crown hotel with dojo members in Okinawa, delegates from Tokyo and foreign country. Party began from salution from Tamayose sensei & Ohomine sensei. Association dedicated gift to Takara sensei for his 60 years of dicipline and Omine sensei and Water sensei for their 50 years of dicipline and announced e-mails from ovweseas members for Takara sensei. 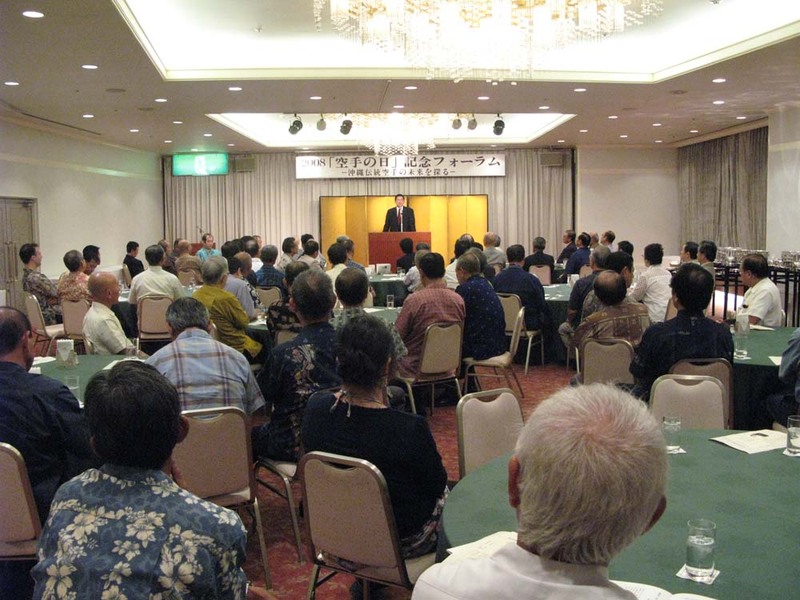 The 1st general meeting was held at Okinawa crown hotel.All participants wear the polo shirts made for this event and discussed about many topics. minutes of the meeting will be annnounced on web site. 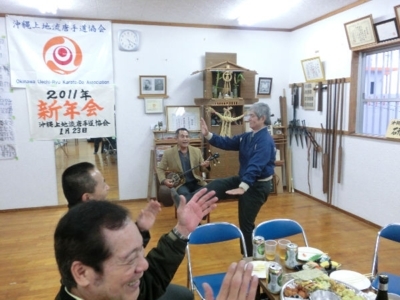 Okinwa Uechiryu association started 1st step from this meeting.We obey instruction from Takara sensei and cooperate with Uechi-Ryu Karate students from Japan and overseas and try to expand this karate style. We solicite your continuous support toward us. 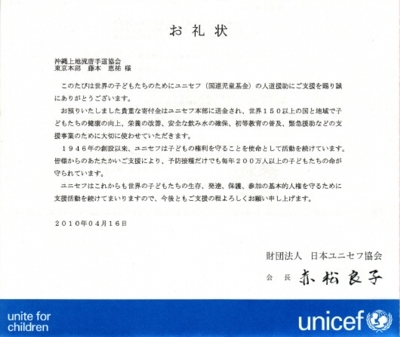 Okinawa Uechiryu Karate-Do Association Tokyo Branch decided to donate part of Kyu test application fee to UNICEF from 2010 based on idea of Children are property of the world. Our head office also think of donation to such organization. We solicite your support for this action. 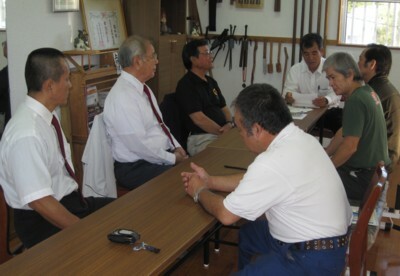 We held head office board meeting on 6th / March,2010 under obserbation of top grand master Takara sensei and discussed about our schedule of seminer on May and judgement for application of approved dojo from overseas. We will announce about official approval of dojo once, it is approved and show result on web site. We OKINAWA URCHI RYU KARATE-DO ASSOCIATION plan to have general meeting for domestic and foregin dojo leaders and members (BLACK BELT CLASS).We welcome your attendance for this meeting. We have made a final decision to establish a new organization with keeping Okinawa Karate-Do Association as the parent body, in order to contribute for further development of Uechi-ryu Karate-Do. We would like to provide you with the following basic policy of the new organization and sincerely to expect your participation. 2. Goal of the organizational activities is the development of all the affiliated dojo and members by studying together, cooperating and harmonizing each other. 3. The new organization must be operated fairly, openly and democratically. 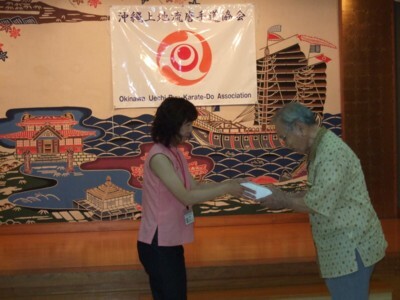 l The present emblem of Okikukai is planned to be used for the new association in succession. l The new association will be officially organized on January 1st, 2010.
l The new association will send a detailed material to any Dojo owner and master instructor who hope to join the new association. A Happy new year, 2010 ! 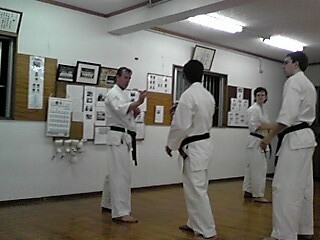 HQ & Dojo guidance in Okinawa ! Since 2005, the Okinawa Karate News has been published and distributed freely in Okinawa. Depuis 2005, l'Okinawa Karaté Nouvelles a été publié et distribué gratuitement à Okinawa. 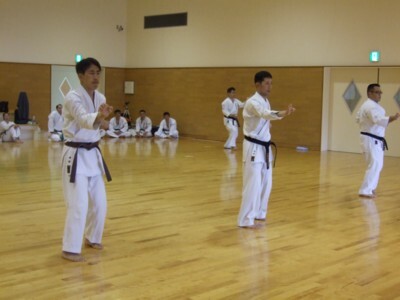 A monthly bilingual newsletter, it introduces Okinawa karate and kobudo in Okinawa and overseas. Un bulletin mensuel bilingue, il introduit le karaté et kobudo d'Okinawa à Okinawa et à l'étranger. If you happen to come to Okinawa, you can find it at the Shureido Store in Tomari where it is freely distributed. S'il vous arrive de venir à Okinawa, vous pouvez le trouver à la boutique Shureido de Tomari où il est distribué gratuitement. Or you can contact us anytime. Ou vous pouvez nous contacter à tout moment. For those who wish to receive it outside of Okinawa, a subscription system is available for a small fee. Pour ceux qui souhaitent les recevoir en dehors d'Okinawa, un système d'abonnement est disponible pour une somme modique. As many of the participants have realized, this event was in part made possible due to the red cap volunteer interpreters. Comme beaucoup de participants ont pris conscience, cet événement a été en partie rendu possible grâce à la PAC des interprètes bénévoles rouge. For 4 days, 113 men and women devoted their time to welcome and support the many foreigners who came to the birthplace of Okinawa. Pendant 4 jours, 113 hommes et les femmes ont consacré leur temps d'accueillir et de soutenir les nombreux étrangers qui venaient à la maison natale d'Okinawa. Once again, I would like to say “Thank you to you all.” Une fois de plus, je voudrais dire "Merci à vous tous." 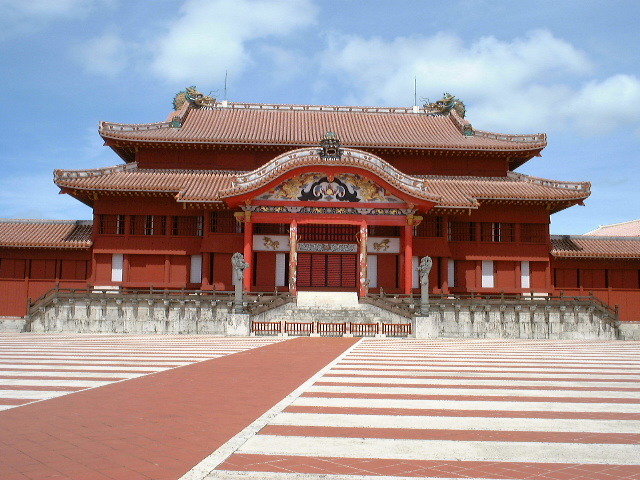 The selection of Okinawan?participants that will take part to the world tournament scheduled for August 15 was held on May 16 at the Okinawa Budokan. La sélection des participants d'Okinawa qui prendront part à la Coupe du monde prévue pour le 15 août a eu lieu le 16 mai au Budokan Okinawa. 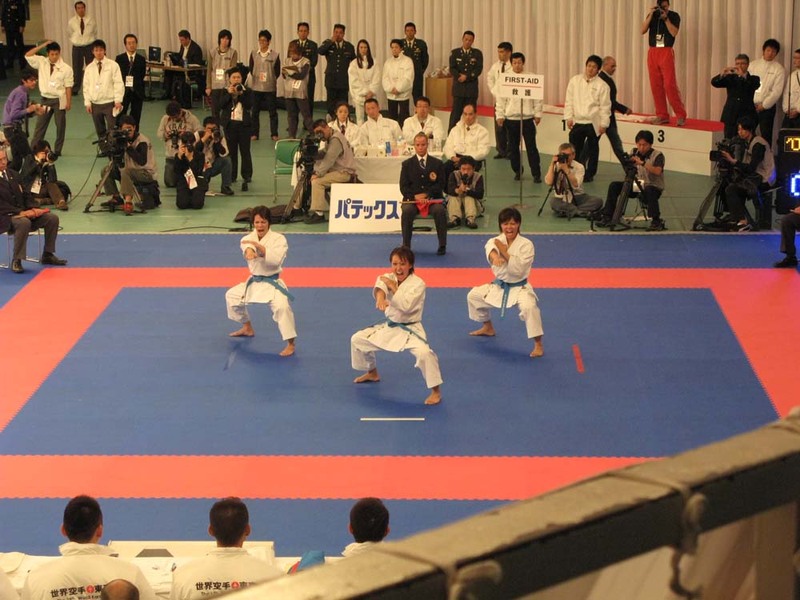 The best karateka in Okinawa were present competing to reach the best 8 so that they could join the tournament. Le meilleur karatéka à Okinawa étaient présents en compétition pour atteindre les 8 meilleurs afin qu'ils puissent participer au tournoi. Among the winners are Shinjo Narihiro sensei (Uechi-ryu Kenyukai) in Senior division, Nakamoto Yuichi (Goju-ryu) in adult and Nakamine Narihito (Uechi-ryu) in Youth. Parmi les gagnants sont Shinjo Narihiro sensei (Uechi-ryu Kenyukai) dans la division senior, Nakamoto Yuichi (Goju-ryu) chez l'adulte et Nakamine Narihito (Uechi-ryu) dans la jeunesse. While in most tornaments in Okinawa Uechi ryu is not quite represented, they did quiet good at this selection, with many participants of this style competing. Alors que dans la plupart des tornaments à Okinawa Uechi Ryu est pas tout à fait représentés, ils faisaient du bien tranquille à cette sélection, avec de nombreux participants de ce style concurrents. 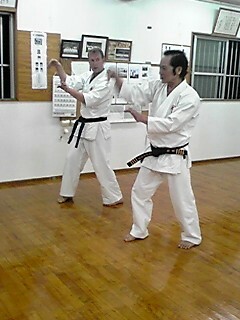 In Kobudo, Nakamoto Mamoru won in sai and Miyasato Eisuke won in bo. En Kobudo Mamoru Nakamoto, a remporté à Sai et Miyasato Eisuke gagné à Bo. The2009 Okinawa World Tournament is underway. The2009 Okinawa Tournoi mondial est en cours. On January 13, 3 preparative sections were set: the Competition Section headed by Gibu Sokuichi sensei, the Referee Section headed by Chinen Shinzo sensei and the Demonstration Section headed by Asato Nobuhide sensei. Le 13 Janvier, 3 sections de préparation ont été fixés: la Section de la concurrence dirigée par Imura Takahashi sensei et Gibu Sokuichi sensei, la Section Arbitre dirigé par Sensei Chinen Shinzo et la Section de démonstration dirigée par Asato Nobuhide sensei. In Tokyo at the 19th World Karate Championships, the Japan national women kata team composed by 3 Okinawan members (left to write: Kadena Yoshie, Shimizu Yuka and Kinjo Sayuri) won the 19th world champagainst France. À Tokyo, à la World Karate 19èmes Championnats, l'Office national des femmes du Japon kata équipe composée de 3 membres d'Okinawa (de gauche à écrire: Yoshie Kadena, Shimizu et Yuka Kinjo Sayuri) a remporté la 19e champagainst monde en France. An other proof that Okinawa is kata No.1! Une autre preuve que Okinawa est n ° 1 kata! Congratulation to the 3 athletes, students of Tsuguo Sakumoto sensei of Ryuei ryu. Félicitation aux 3 athlètes, des étudiants de Tsuguo Sakumoto sensei de Ryu Ryuei. 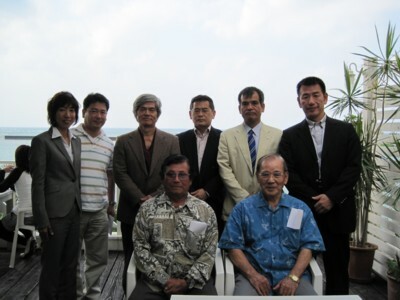 On Thursday, November 6, 2008, the Okinawa Governor and President of the Okinawa Dento Karatedo Shinkokai Hirokazu Nakaima officially established the executive committee for the 2009 Okinawa World Karate Kobudo Tournament. Le jeudi 6 Novembre 2008, le gouverneur d'Okinawa et le président de l'Okinawa Dento Karatedo Shinkokai Nakaima Hirokazu officiellement créé le Comité exécutif pour l'édition 2009 du tournoi World Karate Okinawa Kobudo. 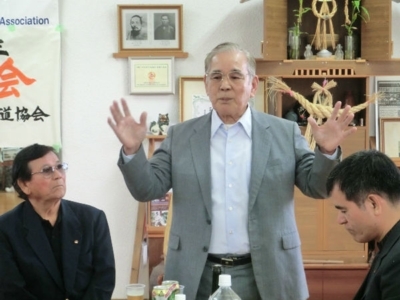 The ceremony was held at the Okinawa Prefecture Government Office and all the major karate associations' representatives were present, together with the main local companies that will support the event. La cérémonie s'est déroulée à la préfecture d'Okinawa et un bureau du gouvernement les principales associations de karaté tous les représentants étaient présents, ainsi que les principales sociétés locales qui soutiennent cet événement. The tournament and related events dates are August 14-16, 2009. Le tournoi et autres dates des événements sont 14-16 août 2009.
participants doit être accepté de Janvier à Mars 2009. Underthe auspices of the Okinawa Karatedo Rengokai led by Isamu Arakaki sensei (Shorin ryu), the 4th Karate day (Karate no hi in Japanese) celebration was held at the Loisir Hotel in Naha City on Saturday, October 25th. Underthe auspices du Karatedo Rengokai Okinawa dirigé par Isamu Arakaki sensei (Shorin Ryu), le karaté 4ème jour (Karaté aucune salut en japonais) célébration a eu lieu à l'Hôtel de ville de Naha Loisir, le samedi 25 Octobre. This year, Mr. Bin Konno, a karate master and writer was invited to talk about "Okinawan traditional karatedo in the 21st century". Cette année, M. Bin Konno, un maître de karaté et écrivain a été invité à parler de "Karatédo traditionnelles d'Okinawa au 21ème siècle". About a 100 masters of the Rengokai joined the event. A propos de 100 maîtres de la Rengokai rejoint la manifestation. .According to Tobaru Keicho, secretary of the Shinkokai, the event executive committeewill be set November 6, 2008. . Selon Tobaru Keicho, secrétaire de la Shinkokai, l'exécutif committeewill cas être mis en Novembre 6, 2008. So far, a Kata tournament, demonstrations and seminars are scheduled to be organized. Jusqu'à présent, un tournoi de Kata, démonstrations et séminaires sont prévus pour être organisés. 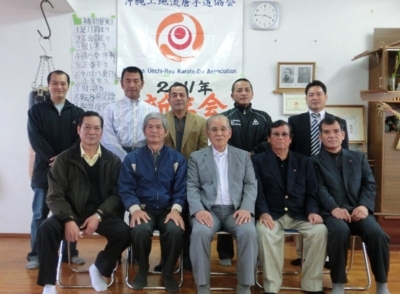 The Okinawa Dento Karate Shinkokai Has Announced That THE WORLD OKINAWA KARATE TOURNAMENT & KOBUDO Will Be Held in August 2009. 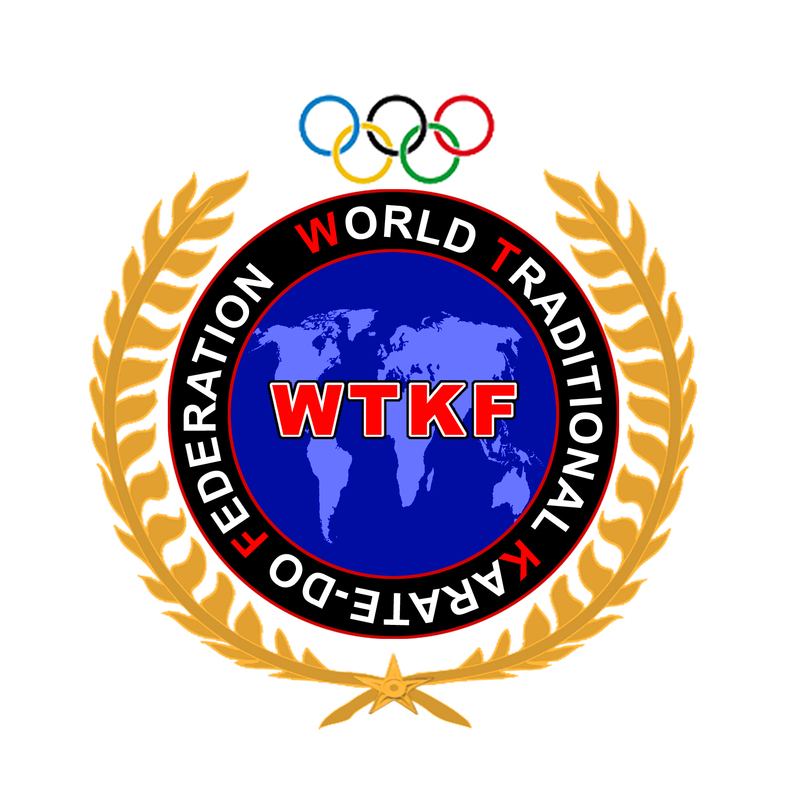 The Okinawa Karatedo WTKF announced that the seminars of Okinawa Karate Masters World Tournament will be held in August 2010. More information to come soon. Information will be communicated to all members of the organization. 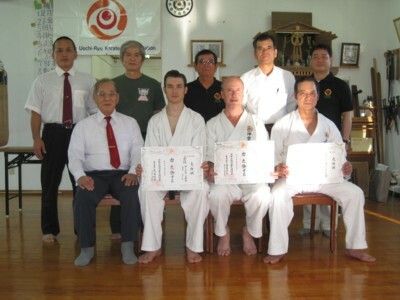 The Okinawa Dento Karatedo Shinkokai has announced that THE OKINAWA KARATE & KOBUDO WORLD TOURNAMENT will be held in August 2009. 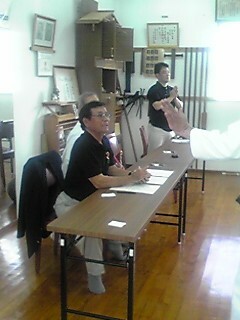 Le Okinawa Karatedo WTKF a annoncé que le seminaires des Maitres karaté OKINAWA Tournoi mondial aura lieu en août 2010. More information to come soon. Des informations vous seront communiqués à tous les membres de l'organisation. 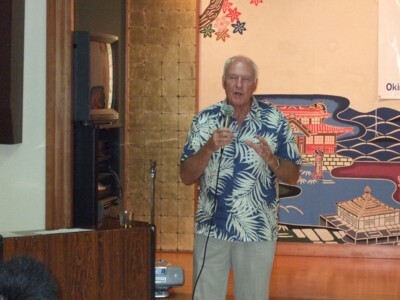 In his speech at the seminar instructors in Okinawa after the Gashuku the Masters, in parallel, Imura Takahashi sensei intervened to trace the evolution of karate-do of his organization and its structures WTKF continental Asia, America, Europe and also highlighted the progress of continents Africa, Arab and Maghreb or Gashuku Kyu and Dan examination and instructor and ran the month of August 2009 in Tunis from 13 to 18 under the technical direction of Sensei 7th Dan Amara Adoul world Chief Instructor and Sensei 6th Dan Brahim Sebbak chief instructor both responsible WTKF. Dans son allocution lors du seminaire des instructeurs à Okinawa apres le Gashuku des Maitres, en parallele, sensei Imura Takahashi a intervenu pour retracer l'évolution du karate-do de son organisation la WTKF et de ses structures continentales Asie, Amerique, Europe et a aussi mis en relief la progression du continents Afrique, Arabe et Maghreb ou un Gashuku et examen Kyu et Dan et instructeur s'est déroulé au mois d'Aout 2009 à Tunis du 13 au 18 sous la direction technique de sensei Amara Adoul 7e Dan world chief instructor et de sensei Brahim Sebbak 6e Dan chief instructor tous deux responsable de la WTKF. Sensei Imura n'a pas omis de mettre en avant les efforts de nos responsables en vu d'installer un siege à DUBAI WTKF et ce dans le cadre du deploiement de notre organisation dans la region. De meme, qu'un séminaire pour Instructeurs Europe est arreté à la date de 12 au 18 Juin 2010 à Londres sous la direction de sensei Imura Takahashi et Kenji Nakamura. Imura Sensei did not fail to highlight the efforts of our leaders in a casual light install in DUBAI WTKF and this in the deployment of our organization in the region. 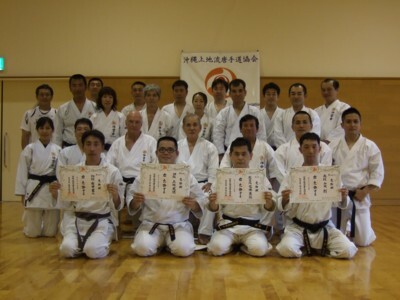 Similarly, a seminar for instructors Europe is stopped at the date of 12 to 18 June 2010 in London under the direction of Sensei Imura Takahashi and Kenji Nakamura. The 2008 World Budosai will kick in July 20 for a week. Le monde de 2008 Budosai débutera en Juillet 20 pour une semaine. Like in 2004, we will be involved with the organization. Comme en 2004, nous serons impliqués dans l'organisation. We are looking for volunteerstaff for the event. Nous recherchons des volunteerstaff pour l'événement. If you are interested, let us know (098-863-5514). Si vous êtes intéressé, contactez-nous (098-863-5514). En Octobre 2010 IOGKF l'Afrique du Sud sera l'hôte d'un des événements les plus unique dans l'histoire IOGKF! 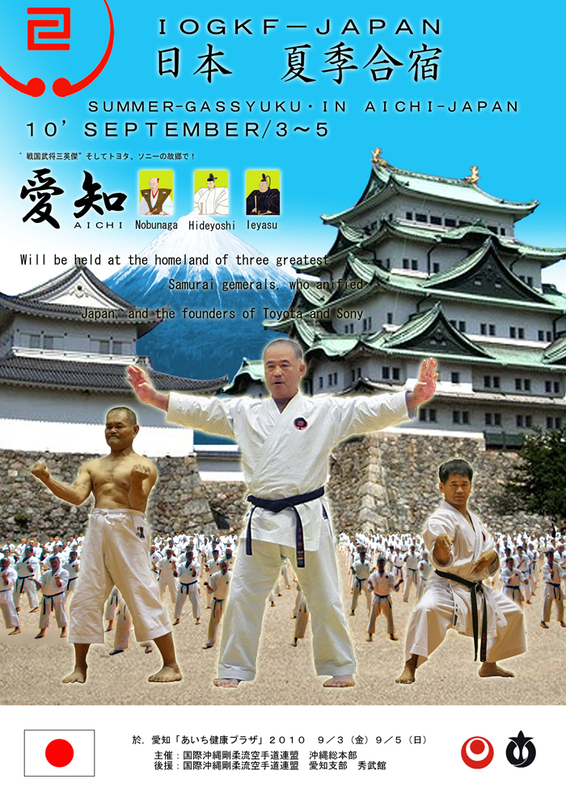 Cette semaine, événement d'une durée sera supervisé par le Grand Maître Morio Higaonna, aidé par sensei Laubscher Bakkies et d'autres éminents hauts instructeurs IOGKF. Les membres auront l'occasion d'assister et de participer à l'un des trois événements suivants IOGKF officielle. Le 2010 instructeurs Pays IOGKF en chef Gasshuku (? ?) pour les instructeurs en chef des pays et les principaux membres du 5e Dan et plus. Une IOGKF Gasshuku international (? ?) , connu sous le nom Gasshuku Ubuntu (? ?) - Le premier en Afrique du Sud depuis 1985. Le tournoi officiel 2010 IOGKF amitié mondiale - Un tournoi organisé tous les quatre ans à compter de 2006 au Canada. Un effort particulier a été fait pour accommoder les membres subalternes qui constituent la majorité des membres dans le monde entier IOGKF. Notre thème pour cette manifestation est «Ubuntu», Un concept dérivé de l'Afrique «Ubuntu umuntu ngabantu ', Ce qui signifie "Une personne est une personne grâce aux autres» mettant l'accent sur les allégeances et les relations les uns avec les autres. «Un voyageur à travers un pays s'arrête à un village et il n'a pas eu à demander de la nourriture ou l'eau. Une fois, il s'arrête, le peuple lui donner à manger, le distraire. C'est un aspect de Ubuntu mais il aura divers aspects. Ubuntu ne veut pas dire que les gens ne devraient pas se régler. La question est donc: Allez-vous faire pour permettre à la communauté autour de vous pour être en mesure d'améliorer? à travers un pays s'arrête à un village et il n'a pas eu à demander de la nourriture ou l'eau. Une fois, il s'arrête, le peuple lui donner à manger, le distraire. C'est un aspect de Ubuntu mais il aura divers aspects. Ubuntu ne veut pas dire que les gens ne devraient pas se régler. La question est donc: Allez-vous faire pour permettre à la communauté autour de vous pour être en mesure d'améliorer? National Sports Center Menouba Tunis, Tunisie. 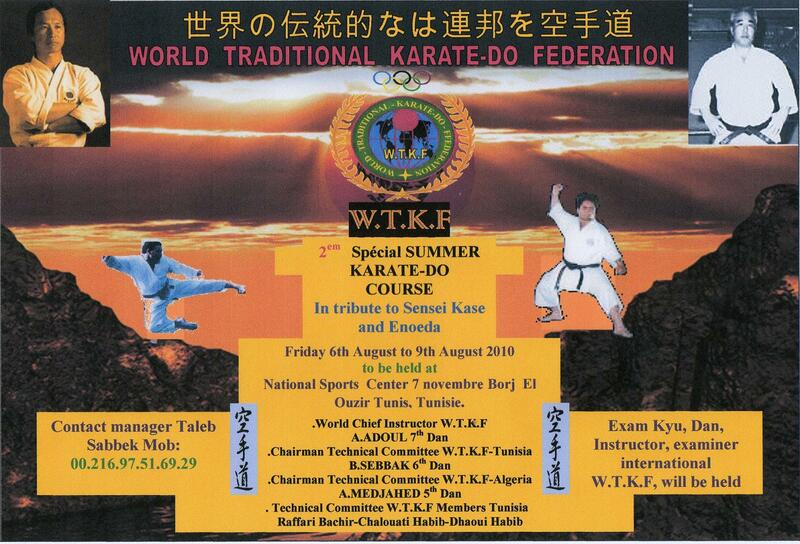 A report on the success of the 2nd Special Summer Course Karate-do has been forwarded to Headquarters Honbu Dojo Japan WTKF Sensei ADOUL Amara. For the first time Menouba Tunis Governorate locality was characterized by good organization and support by all local authorities in particular Madam delegated sports and the representative of the central party committee of the President of the Tunisian republic that have marked their presence to their governor and his youth development center for a school in Tunisia and the Maghreb. 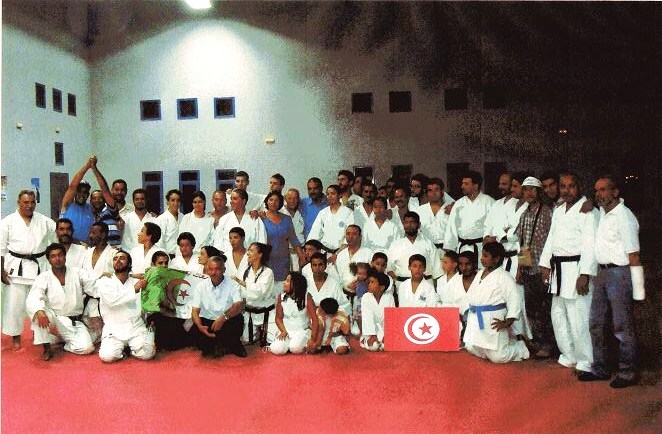 Brahim Sebbak sensei chief instructor representative of Tunisia with his staf WTKF Bashir Habib Chelouati Ghaffari and have made great efforts for the success of the event. Kyu and Dan An evaluation was conducted with much rigor or winners have excelled in various events in kyon, kata and kumite. highlighted their competence on the tatami and demonstrate the high level they have achieved appreciable thanks to their devotion and passion for their karate-do in life. Un rapport sur le bon déroulement du 2e Spécial Summer Karate-do Course nous a été transmis au siege Honbu Dojo WTKF Japan de Sensei Amara ADOUL. Pour la premiere fois Menouba Tunis localité gouvernorat s'est distingué par la bonne organisation et le soutien par l'ensemble des autorités locales en particulier Madame la déléguée des sports et la representante du comité centrale du parti du Président de la republique Tunisienne qui ont marqués de leur presence à faire de leur gouvernorat et de sa jeunesse un pole de developpement des écoles en Tunisie et dans le Maghreb. Sensei Brahim Sebbak chef instructeur Tunisie representant de la WTKF avec son staf Bechir Ghaffari et Habib Chelouati ont déployés beaucoup d'efforts pour la réussite de la manifestation. Une évaluation Kyu et Dan s'est déroulé avec beaucoup de rigueur ou les lauréats se sont distingués dans les differentes epreuves en kyon, kata et kumité. ont mis en relief leur competence sur le tatami et demontrer le niveau fort appreciable qu'ils ont atteint grace à leur abnegation et à la passion de leur vie au karate-do. Les Sensei Adoul 7e Dan, Sebbak 6e Dan, Medjahed 6e Dan, Mabrouk 5e Dan. Menouba Tunis à été l'ocassion de confirmer à travers la manifestation du 6 au 9 aout le soutien des autorités locales à sa tete Madame la délégué des sports du Gouvernorat d'une relance des écoles de karaté-do de la WTKF et en faire le centre au Maghreb piloté par le Sensei Brahim Sebbak expert de haut niveau 6e Dan. L'Association japonaise des maîtres de karaté en Amérique du Nord ou le Karate-do Shihan - Kai , a été fondée en 1994 comme une organisation vouée à la promotion , la culture, et le maintien d' une compréhension des principes de la tradition des arts martiaux japonais , à la fois techniquement et philosophiquement . Il ya 36 membres fondateurs de l' Shihankai , qui ont atteint " Master Level " la situation dans leur art , et qui enseignent les arts martiaux traditionnels japonais en Amérique du Nord . L'expérience et la connaissance de ces 36 membres fondateurs représente la sagesse collective des générations et des siècles d' arts martiaux traditionnels du Japon. Par conséquent , les membres Shihankai visent à éduquer le peuple à l'Ouest comme à la véritable signification des formes traditionnelles des arts martiaux japonais , et d'énoncer des lignes directrices pour faire respecter les normes élevées de l'enseignement de ces arts . En outre, Shihankai vise à promouvoir l'amitié et la compréhension entre ses membres , qui se compose de nombreux différents styles de traditionnelles des arts martiaux japonais . En 2005 , l'association des Maitres japonais de Karate-do Shihankai a été constituée à but non lucratif ( 501c3 ) organisation. Pour sa première grande activité de financement , l'association Shihankai accueilli ses maîtres événement mondial le premier ministre du Soleil Levant - l'Ame du Karaté Traditionnel le 6 Octobre 2007. Voici maîtres fondateurs Shihankai a chanté et a démontré à la Performing Arts Center ( Recital Hall ) , à Purchase College ( Université d'État de New York) . Jamais auparavant dans l'histoire des arts martiaux avait tant de maîtres de différents styles partagé la scène et co- parrainé un tel événement. En outre, l'association de Karate-do Shihankai officiellement déménagé son siège social à Longmont Colorado en avril 2010 . Il est maintenant Registerd dans le Colorado en tant que non - lucratif ( 501c3 ) organisation. L'association de Karate-do Shihankai est basé sur une philosophie de la non - Ryuha (style ) , non - Kyokai (association) exclusive et est au-dessus de tous les styles et ces associations pour embrasser le respect mutuel et la confiance. L'asociation membres Shihankai donc ouvert leur cœur et apprendre les uns des autres techniques et philosophiques acquis . Hokubei Karate-do Shihankai accueille désormais maîtres américains de l'organisation . Les maîtres fouding du soleil levant considère que c'est un honneur de la main un flambeau de l'héritage de l'Amérique du karatékas . Il ya beaucoup à faire par les maîtres fondateurs pour atteindre l'objectif . Mais nous sommes déterminés à parvenir à la main dans la main avec l'objectif maîtres américains .